Get the Professional 52" Snake Tong to Remove or Catch Snakes with minimal risk of damage ! LIFE TIME WARRANTY(100% SATISFACTIONS GUARANTEED)! We are truly grateful to help & guide each individual customer through any trouble encountered with our products. Why choose IC ICLOVER professional Snake Tongs? 1. Will it slip off from the sweaty hands? -- No worries. Our unique contoured pistol grip ensures you a firm hold of our snake tong even with sweaty hands. 2. Will this tool harm the snake? 3. Will it work on small snakes? -- Yes, of course! One of the prongs has a slot allowing the point of the other to pass through so that there is no minimum gap. 4. Will this work on large snakes such as pythons ? -- YES it opens wide enough. Most pythons are at lease three feet long and 1 1/2 inched at the mid section, it would work on this size. -It also can be a family essential tool for Key Pick Up, Kitchen Shelves, Fishing, Litter Picker, Garden Nabber, Handicapped / Disabled and Arm Reach Extender. IC ICLOVER is a registered trademark protected by US Trademark Law. IC ICLOVER products are sold by authorized sellers only. 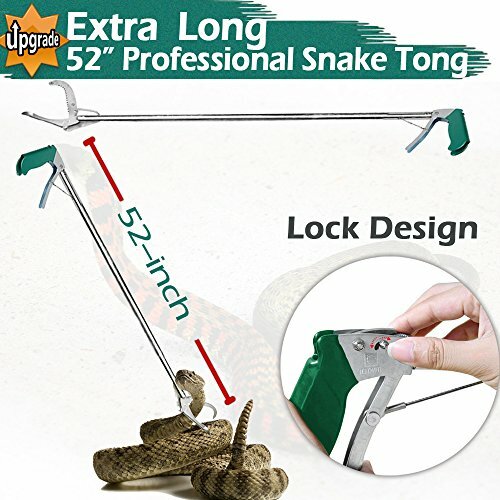 [52" Long Reptile Snake Tongs] - Professional 52 inch Snake Tong Reptile Grabber for safely catching and handling snakes. Ensures You Keep a Safe Distance Away. [Sturdy and Durable] - Made of aluminum alloy 19mm tube with extra repair kit,very sturdy and durable, not easy to break. Hand contoured pistol grip style handle is comfortable to hold. [ Multi Function ] - The snake tongs can be used for camping, removing pet reptiles, catching handing separating snakes, etc. Especially fit for the people who do not want to harm them. It also can be a family essential pick-up tool for kitchen shelves, fishing or as litter picker. If you have any questions about this product by IC ICLOVER, contact us by completing and submitting the form below. If you are looking for a specif part number, please include it with your message.